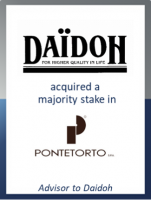 GCA has acted as exclusive financial adviser to Daidoh Limited, a Japanese group listed on the Tokyo Stock Exchange which produces textiles and men’s and women’s garments sold in Japan, China and Western countries, on its majority stake acquisition of Pontetorto S.p.A. Pontetorto, based in Prato, Italy, has for half a century been producing high quality fabrics for clothing (in particular with its Fashion Division, that manufactures wools and fibers mainly for ladieswear, and with its Sportsystem Line for fleece fabrics for active wear and outdoor). This represents a strategic deal for both companies that will extend their presence through synergies, both in terms of product and markets. Pontetorto will benefit from a capital strengthening and will consolidate its presence in Asia, where the company already has its own trade agents, also through Daidoh’s production and sales channels. Daidoh will have the opportunity to increase its penetration into the European market thanks to Pontetorto’s channels, integrating its fashion business with women’s fabrics. In terms of governance, the Banci brothers will remain shareholders and, above all, they will keep managing the company. Pontetorto will retain its Italian identity, therefore neither the structure, nor the management will be changed. Daidoh will nominate some members to the new Board of Directors, who will bring their international experience to Pontetorto.